For today’s deals roundup, we’ve put together a bunch of speakers from brands like Logitech, F&D, Ambrane and more. Want speakers but have a limited budget? Don’t worry, we got you covered. Our today’s deals roundup consists of speakers from brands like F&D, Logitech, Ambrane and more. Most of the deals are under Rs 500. So without adding further, let’s get started. The Zebronics Saga Portable Speaker lets you stream music via Bluetooth connectivity. It also has a microSD card slot and an AUX port through which one can simply plug in to compatible devices and to listen to music. The device is also equipped with a built-in FM which gives a user an access to wide range of channels. You can purchase this device here. The iVoltaa Rugged X1 portable Bluetooth speaker is a water and dust resistant device. It comes with a built-in mic that let users answer calls when the phone is connected to the speaker. The device is also equipped with four buttons at the front which can be used for managing volume, music tracks, and calls. You can purchase this device here. 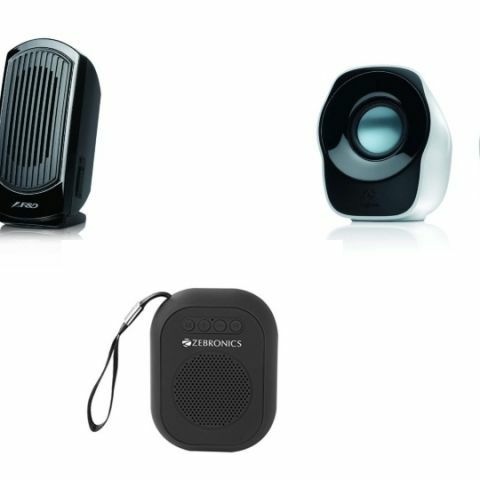 The Logitech Z120 is a compact speaker which is compatible with a wide range of devices. You can also connect the speakers to your laptop or smartphone via USB or AUX cable. The device is also equipped with a knob at the front for controlling volume. You can purchase this device here. The Ambrane BT-1100 is a Bluetooth speaker that lets you stream music via memory card or AUX cable. The device comes with a 520mAH battery which as per the company, can provide audio playback of four to six hours with a charging time of two hours. You can purchase this device here. The F&D V10 Multimedia speaker features USB 2.0 channel. The company is also providing two years warranty that does not cover physical damage. You can purchase this device here.